After three novels chronicling the experiences of Russian-Jewish immigrants in America, Gary Shteyngart has turned his attention to a nonfiction version of the story–his own. His memoir, Little Failure, was released this year to much acclaim–the New York Times called it “raw, comic and deeply affecting.” Moment‘s Sala Levin talked with Shteyngart about the respective advantages of fiction and nonfiction, what he’s learned about his family history and what’s next on his horizon. How much longer do I have? I thought I would get it all down on paper before the inevitable. Forty-two is, like, 73 in Russian years. Also, I wanted to get rid of all of the material that I have stored up about the Russian-Jewish experience so that I could write about something else for a change. So I thought that this would be a kind of fire sale where everything about me must go. If you read this book and you don’t know anything about me, then something is wrong. So are you not going to write about the Russian-Jewish experience anymore? I’ll come back to it, but I think for the next book I need to write about something else. The non-Russian, non-Jewish experience. What was the process of writing the book like? What kind of research did you do? Tons. I took my parents back to Russia, which is the last chapter of the book. I spent a lot of time interviewing them. I don’t remember much from Oberlin because I was always stoned, so I had to interview a lot of people who went to school with me and realized that a lot of things that I thought had happened never really happened. Did you know the family history before you started writing the book? I kind of knew some of it. I guess I kind of assimilated it into my mind without really thinking about it. My father’s first memories were his father dying on the front right outside of Leningrad as a solider being killed by German troops, then being evacuated and having to dive under a train car as the Germans sprayed the train, then his best friend dying of malnutrition at age three. It just went on and on and on. My mother has photo albums with titles like “Uncle Aaron and Uncle Simon, Dead Family, Buried Alive, Russia, 1941.” It’s this sense that the history was just so much bigger than it was when I was growing up. It began to explain a lot about [my parents]. Any thoughts I had about them being tough immigrant parents was replaced by being awed by everything they had gone through. Was there anything that surprised you during your research? You live through life and you’re going through it, and as a writer you stop and write things down. What I realized is that so many things I had written were saved up—like the “Ganorah,” my version of the Torah, where Exodus becomes “Sexodus.” All that stuff was safe. When you’re a writer and you need to look into your own mind, you can just open up a book and find it. That’s true of anybody who keeps a journal. So I guess the lesson here is keep a journal. Revisit one of your younger selves. The iPhone has been very instrumental because I just type everything down as I go along. Was there anything that you thought was too personal to put in the book, or did anyone have veto power over things that went in the book? No, not at all. If you’re going to write a memoir, what’s the point of not putting everything in there?. What did your parents think about you writing the book? Well, they haven’t read it because their English isn’t up to snuff. So that’s good. When you talked to them about it, what were their feelings? I think they were apprehensive, as anybody would be writing a personal book about them. But they were very forthcoming. So much of this book is just them talking and me catching everything they’re saying. Did your feelings about your parents change as you wrote the book, or on refection? Yeah. I realized that my father wanted to be an opera singer but good luck being an opera singer as a Jew in 1960s Leningrad. It just wasn’t going to happen. So I realized just how different things were for me. There was really no baseline for comparing my life to theirs because theirs was so absolutely messed up. How was writing a memoir different from writing fiction? Well, you can’t lie. That’s the big problem. Lies are a writer’s best friend because if you need something to happen you just make it happen. You can play God, in a sense. With a memoir you have to stick to the truth. That imposes a lot of roadblocks on what you’re doing. But it also gives you a sense of freedom from having to make things up, because what you’re doing is you are mining your own path. Does one genre feel more natural to you than the other? For me, in the end writing is writing. I do a lot of nonfiction. I do a lot of travel writing. The tone I use is often very similar from one to the next. You could take a sentence out of the memoir and stick it into the novel and I think it wouldn’t seem outlandish in one of my novels. So I think the writing is what’s the most important. Now that you have a child, how has family life changed your writing? How are you finding the balance between the family life and writing life? Well, this kid is a real blessing because he sleeps as long as I do, which is quite a bit. He’s about a year old, but man, he loves to sleep. I love that. So it hasn’t changed that much. Does writing make you more anxious or less anxious? Well, it depends. Obviously when I was writing some of the more painful things in this book I did began to feel discombobulated. I was writing a lot of this at my place upstate. I would finish writing it and I would walk out and be shocked that there was this beautiful landscape around me, because what I was writing about was so difficult. So in that sense it did become very personal. But there is also a lot of exhilaration when you can figure out something that happened and you can put it into words that hopefully describe it well. That’s a very exhilarating feeling. How has life changed for you now that you have had more success as a writer? I think when you’re a writer you can’t be complacent, just as with anything else. You have to keep going and do new things. You can’t just say, “Okay. Well, I’m done. I can just coast and write the same thing over and over again.” That’s not what I want to do. I’m working on a thriller, which is set in the financial world. The main character is a woman who is not Russian, Jewish or anything that I have ever done before. So it’s a very different book. What made you interested in that kind of book? Well, I live in Manhattan half the year. I think everyone in Manhattan works in finance at this point. I’m the last person that doesn’t. What’s going on around here? It’s a world that, it’s there, but nobody really talks about it. People acknowledge the fact that it has a tremendous influence on our lives, but at the same time nobody really understands it very well outside of the industry. It has this very opaque quality, and I thought I wanted to go into that. 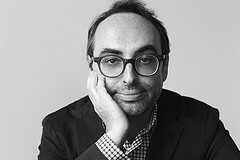 Gary Shteyngart will appear in conversation with Alan Cheuse at the Hyman S. & Freda Bernstein Jewish Literary Festival at the DCJCC on October 29.